Cancer Care West, the West of Ireland cancer charity, is to launch a new bus service for Mayo Cancer patients who travel to University Hospital Galway to receive treatment for cancer. The charity was awarded €100,000 towards the cost of a new bus under Measure 4 of the CLÁR Programme, to fund cancer transport support initiatives, and intends to now proceed with the purchase of a new 25-seater bus. It hopes to have the new service up and running by early 2019. Every year approximately 250 people from Mayo have to travel to University Hospital Galway to receive Radiotherapy treatment, which generally lasts six to eight weeks with one treatment per day. 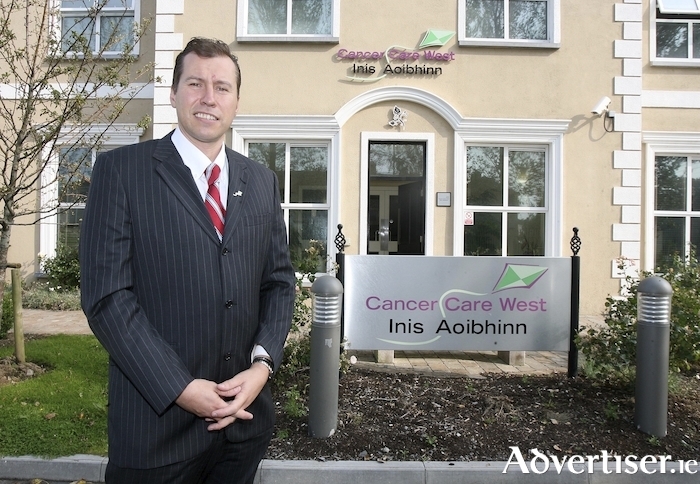 Cancer Care West runs its own 33-bedroom residential service, Inis Aoibhinn, on the grounds of UHG which provides accommodation, Monday to Friday, for radiotherapy patients who travel long distances from home for their treatment. Each year the lodge accommodates over 100 such patients from Mayo and the provision of this service will mean patients have the option of availing of the free transport service to Inis Aoibhinn on Monday mornings, returning home again on Fridays. "Transport for rural West of Ireland patients to and from their treatment is an increasingly significant problem. "There are currently designated bus services from both Sligo and Donegal which transport cancer patients to our lodge on a Monday and home again on a Friday. No such service existed for Mayo patients. "Over one third of the patients that stay with us at Inis Aoibhinn are from Mayo. Many of these are quite elderly and would not be in a position to drive themselves; they would previously have had to rely on family members and friends to drive them to Galway. "A cancer diagnosis is a very difficult time for cancer patients and their families, and we are confident that this new service will help alleviate some of the stress of travel for many patients from Mayo. "We are delighted to receive the funding of €100,000 from the CLÁR programme for this initiative. However, the cost of the proposed new bus is €150,000 and it will cost €50,000 per annum to operate the service. "Cancer Care West do not charge for any of its services and we hope to bridge the funding gap by raising funds for the service through fundraising initiatives in the Mayo region." "I was delighted to be in a position to allocate €100,000 through my Department to Cancer Care West last week for a 25-Seater Turas 600 passenger bus. This funding will help Cancer Care West to transport people to and from their appointments, at what is an extremely challenging time for them and their families. "Cancer Care West makes a huge difference to the lives of people who are directly and indirectly affected by cancer and their staff and volunteers do magnificent work on behalf of people in their community. "This funding will support some of the most vulnerable people in our society. It will have a significant impact on individuals and their families in a rural community. "It is only right that we should support the voluntary groups which provide transport to our sick and vulnerable citizens in order to enable them to access treatment and support. The provision of this funding is recognition by the Government of the wonderful work being done at community level in order to allow these people to access treatment."